It was a big bag of choy sum we had during this holiday but I promise this is the last recipe using it. Its another dead quick and simple dinner using the rest of the bearnaise sauce we had with the Three Bird Delight a couple of nights ago. 1. Put the cauliflower into a pan of boiling water and cook for 4 minutes. 2. Removed from the pan with a slotted spoon and allow to steam in a bowl. 3. In the same pan blanch the choy sum for a minute, remove and refresh in a bowl of cold water. 4. Cook the steak to your liking. For me it is liberally seasoned then 90 seconds per side in a very hot pan. Remove from the pan to rest. 5. Put the cauliflower in a roasting dish and cover with the cheese. Rub the bread between your hands to cover the cauliflower in crumbs. 6. Place under a medium grill until the cheese has melted and breadcrumbs toasted. 7. Make up your sauce. 8. 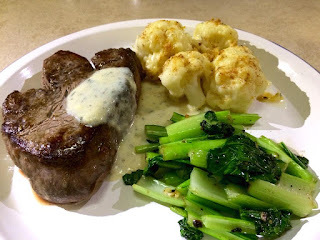 Using the steak pan gently fry the garlic clove then add the blanched choy sum for a minute.